The Magician is surrounded by all of the symbols of the minor arcana: wands, swords, cups, and pentacles. All of the elements are at his disposal and now he needs to figure out how to put the ingredients together. This card symbolizes the ability to pull all the elements together and use them for manifesting. The Magician speaks of creative energy and new beginnings, but also of empowerment and the need for clear focus. 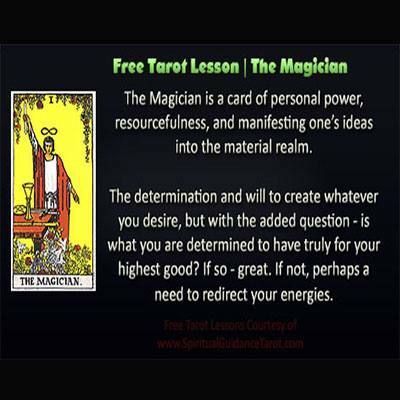 The Magician card combines creativity, knowledge, wisdom, and determination. It speaks of focusing the will towards the highest good and manifesting ideas into a new reality that you actively create. Time to move forward, the action and drive behind the dream, the Magician card tells us to throw ourselves into our vision and bring it into being. He is resourceful, energetic and determined – all of these qualities guarantee his success. emotional/spiritual blockages that need to be addressed as well. 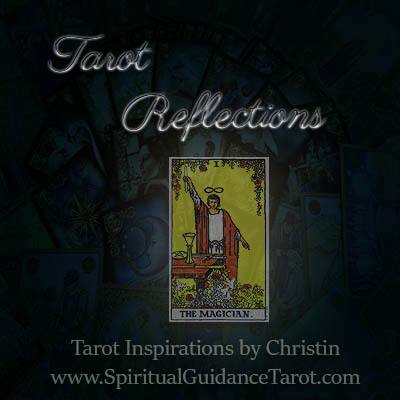 The Magician tells us to focus on the whole of a situation and not merely one aspect. He is able to get multiple things accomplished because he uses all the elements at his disposal with one clear overall focus. This card encourages us to use our drive, determination, and creativity to make positive changes. If you are feeling scattered, or unable to focus, Magician comes to you today to remind you to delve into those feelings, figure out what the blockage is and address it. Do you need a clearer plan? Perhaps you have too many things to do and it seems overwhelming so it stops you? In that case, perhaps brainstorming and organizing your thoughts and ideas may be a better approach. What things can you do today to make yourself feel more focused and empowered?